Activists gathered at a community meeting at Lakewood Village Community Church to address recent murder of Fred Taft who was killed during a family reunion at Pan American Park July 21, 2018. His family insists the killing is a hate crime, but police say they have no evidence to support that. Photo by Robert Casillas. The number of hate crimes reported in Los Angeles County rose 5 percent last year, according to a report released Thursday by the county’s Commission on Human Relations. 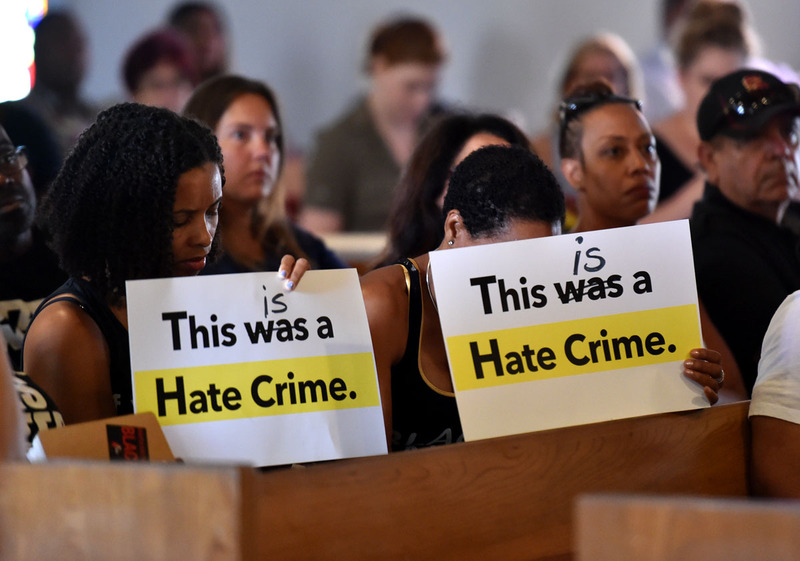 Last year’s increase is just the latest in a trend that’s seen hate crimes increase 32 percent since 2013, something that has officials “extremely concerned,” the commission’s executive director, Robin Toma, said in a statement. Last year’s bump in hate crimes holds true for Long Beach as well, according to numbers provided by the police department. There were 17 hate crimes reported in the city in 2017 compared to 10 in 2016, according to the statistics. Long Beach had some high-profile hate-incidents last year including bomb threats at a local Jewish center, and someone spray-painting the word “illegal” on a church banner and various cars including a Latino man’s van. “The rise in L.A. County mirrors increases in hate crimes in most major U.S. cities in 2017,” Toma said. Of the 508 hate crimes reported in Los Angeles County last year, 50 percent of them were racially motivated, according to the report. Of those crimes, African Americans were disproportionately targeted. “African Americans only comprise 9 percent of L.A. County residents but make up 50 percent of racial hate crime victims,” the commission said in a news release. Crimes targeting the Latino population also rose for the third year in a row from 62 to 72. Crimes targeting the LGBTQ community declined by 2 percent, but most of the crimes reported were of a violent nature. Every single anti-lesbian crime was violent, and crimes targeting transgender victims were also overwhelmingly violent, 94 percent. There were 101 crimes targeting victims for their religion. Of those, 72 percent targeted Jewish victims. In nine cases, hate-crime suspects referenced President Trump’s name.